OAKLAND, Calif. (AP) Golden State returned from a dominant road trip that might help shape its season and showed once more how important depth is to its success. Kevin Durant had 28 points, nine rebounds, five assists and three blocked shots, leading the short-handed Warriors past the sluggish Portland Trail Blazers 111-104 on Monday night. Golden State played without two-time MVP Stephen Curry, who is nursing a sprained right ankle and missed his third straight game. Draymond Green sat out with a sore right shoulder while starting center Zaza Pachulia was sidelined for his second game in a row because of soreness in his left shoulder. Portland star Damian Lillard scored a season-high 39 points with five 3-pointers playing back home in Oakland. He hit a 3-pointer late in the first half with Durant in his face and pumped his arm to celebrate. Durant, who earned Western Conference Player of the Week honors on Monday, shot 11 for 21. Klay Thompson overcame a cold shooting start to score 24 points, and reserve Nick Young contributed 12 points in 13 minutes before leaving with a concussion in the third quarter. David West scored 10 points to reach double figures over consecutive games for the first time with the Warriors and first since 2015-16 for San Antonio. He also had four blocks. Rookie Jordan Bell scored in double figures for the second time with 11 points, while Omri Casspi and Shaun Livingston also started for the defending champions, who were coming off a 6-0 road trip. It marked the franchise’s first time doing so in that long of a stretch away from home. ”We’re going to need that in the future if we want to continue to keep winning with Steph and Draymond out,” Durant said of the contributions from so many players. Now, the Warriors will get to stay home for almost the entire rest of the year except for a trip to face the Lakers on Dec. 18. CJ McCollum scored 21 points in Portland’s fifth straight loss. It was the first meeting of the season between the West rivals after Golden State took all four games last regular season and then swept the Blazers in the first round of the playoffs. 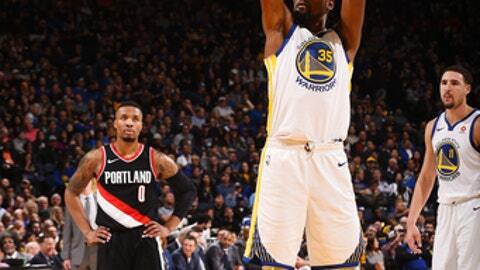 ”In a game like tonight when you have Steph out, Draymond out, we have to understand that other guys are going to come in and be aggressive and try to take advantage of their opportunities,” Lillard said. After missing his first four 3-point tries, Thompson hit from deep in the final 30 seconds of the first half as the Warriors led 59-47 at the break. As he expected to do this winter, Matt Barnes announced his retirement on Monday. Barnes, who received his Warriors championship ring Nov. 27 when Golden State hosted his former Kings and hometown team, posted his news on Instagram with a selfie. Warriors: Durant passed John Stockton (19,711 points) for 44th place on the NBA career scoring list. … Andre Iguodala played his 1,000th regular-season game, becoming one of 126 players in NBA history to accomplish the feat. … Second-year guard Patrick McCaw returned after missing two games with a concussion and bruised nose. … Curry rode a stationary bike during the morning shootaround. Pachulia took some one-handed shots during warmups. … Golden State committed five first-quarter turnovers and 14 in all. Trail Blazers: At Miami on Wednesday. Warriors: Host the Mavericks on Thursday.